The American Indian art world is abuzz with the work of Maria Samora, and why shouldn’t it be? For a young jeweler in her 30’s, the list of accolades is continually growing. Maria’s jewelry is simple contemporary perfection – restrained elegance created through masterful metal working techniques. Though she is from Taos Pueblo, Maria Samora’s pieces do not at all look traditionally Native American, but they are certainly grounded in elements of the natural world. “Lily Pad,” “Raindrop,” and “Persistence of Light” are different pieces of Maria’s that demonstrate both a keen awareness of nature and a deep appreciation for the handmade character of traditional jewelry. Maria Samora’s first Santa Fe Indian Market was in 2005, and in a relatively short time, she has become a “star.” In 2009, Maria became the poster artist for SWAIA’s Indian Market. She was the youngest to have ever received such an award, the first jeweler, and one of only three other women selected in the market’s 88 year history. 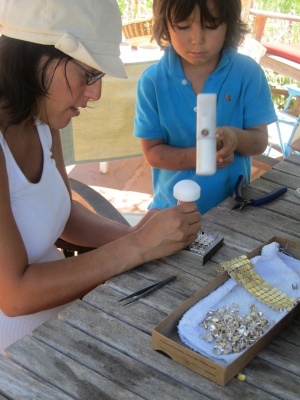 Already, she’s been featured in at least 4 books on American Indian jewelry, and most recently, Maria took home the Best of Jewelry Award from the 2011 Heard Museum art market. She received the award for an exquisite, one-of-a-kind silver and gold purse that she made by hand after a full year in the design and fabrication process. 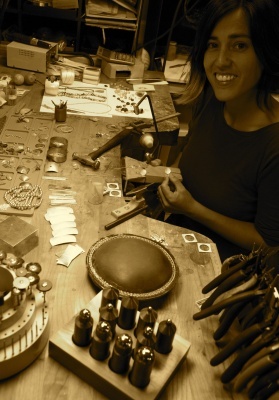 Maria is not one of those artists who knew early on that jewelry making would be her path. She happened upon this path in 1998, after college, when she took her first jewelry-making class for fun. It was not until a rigorous apprenticeship with goldsmith Phil Poirier that Maria discovered what she was truly meant to do. Once she had acquired the technical ability, Maria’s inspirations could easily come to life. She uses an array of techniques, often combining metals such as sterling silver with gold that she alloys herself and hand forges. Using ancient Incan practices of coloring, Maria can make 18kt gold earrings look as rich as 24kt gold while retaining the hardness of the 18kt. Lately, she has perfected an ancient Korean method of keum-boo, where she applies thin sheets of gold to silver – the result is striking jewelry with a lovely mix of metals. This mix of metals is somewhat of a signature of Maria’s, for it brings a depth of color and sophistication not commonly found. One of the things that impresses me the most about Maria is that she has such great technical ability that she can do anything, yet she knows how to show restraint in her jewelry. You will never see anything made by Maria Samora that is in any way over the top. Her work is always classy, relying on clean lines and subtle textures. Her jewelry is not just striking to look at, it also fits the body perfectly when worn. This is because Maria is quite meticulous about wearing pieces herself to make sure that everything fits just right. According to Maria, “It might be an amazing design, but if it doesn’t lie right, feel right – if it’s not durable – people won’t wear it.” We all have that pair of earrings that looks amazing, but we can’t wear them because they are too heavy and hurt our ears. You won’t find that with Maria’s jewelry. I am thrilled by her talent, and I cannot wait to see what the future holds for Maria.